On September 16, 2013, the Libyan National Oil Corporation is going to hold a three-day fest called the Libya Forum for Oil, Gas and Sustainable Growth. The speakers include a mix of Libyan government officials and energy bureaucrats as well as suits from the major oil and gas corporations. The opening session, for instance, will be anchored by a keynote address from the Libyan Minister of Oil and Gas, Dr. Abdelbari al-Arusi (“Building Libya’s Future from Resource Wealth”). Dr. Nurri Berruein, chairman of the National Oil Corporation and Ferdinando Rigardo, regional head of Repsol, the Spanish petrochemical multinational, will join him on the panel. Rigardo is no stranger to North Africa’s oil. In 2011, during the Arab Spring, he was at another such summit in Madrid where he noted in typical corporate jargon, “The bottom-line is European countries may need to increase their involvement within the internal sustainable development of these countries as to maintain and improve relations, which are crucial in the European energy panorama.” In other words, European petrochemical firms will need to bet on the winners and help them secure their dominion so as to ensure the smooth flow of oil and gas across the Mediterranean. Repsol will be standing shoulder to shoulder with political and technical advisors (such as Petroleum Regimes Advisory) and with petrochemical multinationals (such as Eni, Schlumberger, Zakhem). For a week now, the oil workers at the Zueitina oil port near the city of Ajdabiya in eastern Libya have blockaded the port. Last Tuesday, in the evening, just as the oil workers suspended a strike at oil-fields 103A and 103D in honor of Ramadan about a dozen men entered the port and took possession of the facility. One of the engineers at the port reported, “The group arrived and asked that operations be shut down. A ship bound for Italy was being loaded with crude and I had to negotiate with them to allow the loading to continue. It was difficult to convince them but the ship is being loaded. Everything else is shut down.” A week on, a Libyan oil official note, “The situation is still the same. Exports are down.” Indeed, exports dropped from 1.6 million barrels a day to 1.36 million barrels, and electric supply also collapsed. Twenty per cent of Libya’s oil leaves from this port. Local residents in the area of Zueitina have been unrelenting in their demand for jobs in the lucrative oil sector. Last December, about one hundred and twenty people broke into the oil terminal and stopped work there for almost a week. They demanded jobs and health benefits. Deputy Oil Minister Omar Shakmak said at that time that the management closed down operations to “avoid any risk” as he deplored the capture of oil facilities as protest. But this is indeed what continued to occur – in February of this year, in May (when protestors shut down a value that sends oil into the terminal), and again in July. The protests simmer down after deals are made, and then when nothing comes of it, the residents are once more inflamed. What worries the Libyan authorities is the close nexus between oil workers’ struggles and the aggravations of the local residents. That is why Oil Minister al-Arusi hastily met with a delegation of oil workers in Tripoli and told them that some of their demands would be implemented after Ramadan. It would be far too dangerous to allow the oil workers’ grievances to be bundled politically with those of the citizenry who cavil that their sacrifices in the battles of 2011 have come to naught. The oil bureaucrats and their petrochemical friends seem to have made out well. Not so the rag-tag “tribesmen” of eastern Libya. At the annual Aspen meeting on July 20, US African Command head Carter Ham said that the five men suspected of killing US Ambassador Christopher Stevens cannot be arrested because of “the fragility of the Libyan government.” “Progress was made initially,” he said, “but then the government changes, key leaders change.” Stevens was killed in September, when the Prime Minister was Abdulrahim el-Keib, a US citizen with close ties to Washington. By November the government changed, with the new Prime Minister Ali Zeidan far closer to the Europeans (he was the rebel’s envoy to Europe during 2011). Zeidan’s cabinet was also less pro-American, with many of them had been accused of having close ties to the Qaddafi regime – subsequently cleared by the National Integrity Commission. Zeidan’s patience with the current dispensation seems to have altered. Last month, when insurgents seized hold of several government offices in Tripoli, Zeidan’s Defense Minister Mohammed Al-Barghathi offered his resignation. It was refused. Last week, Zeidan sacked al-Barghathi after major clashes paralyzed the streets of Tripoli. Such “suicidal scenes,” Zeidan said, should not be part of the landscape of a modern city. Militias from the different cities of Libya have remained encamped in the capital, demanding a greater share of the spoils. One of the groups had seized the Interior Ministry, which was held for about a week. Their demand was that the government disband the Supreme Security Committee, the agency responsible for law and order in the capital but made up of militiamen whose discipline is questionable. Walking the streets of Tripoli can be fraught, but so can trying to use the airport. Clashes in the Hay Al-Zohour district, near the airport, have become commonplace. It is mainly between militias from Misrata and Zintan who have been at it for over a year. It is one thing for officials to say that these are less city-based militia and more just young people looking for trouble, and it is another for them to admit that these city-based militias who have not been integrated into the armed forces or have found jobs have now morphed into criminal gangs. Oily claims about “bringing them to justice” slide off the backs of the RPGs routinely seen on the shoulders of the young men. Tripoli, being the center of power, has fallen deep into the pit of instability. In the eastern part of the country, the dangers are not less but different. There are the strikes and the attacks on the oil facilities, but these are less violent to the lives of ordinary people. They are reported with drama in the business press because they are violent toward the bottom line. Last month, the army chief Yussef al-Mangoush resigned because of clashes in Benghazi between the Libyan Shield Brigade, the government-sponsored militia and those militias outside government control. Thirty people died. A local activist, Ahmed Belashahr told al-Jazeera, “People protested because they believe militias go against Libya’s stability, which can only be achieved through a proper army and police.” This struggle mirrors what happened in Tripoli this month. Col. Abdel Latif Amdawi el-Mazeeni was shot dead in Derna. What unites these three killings is that all the victims were in the armed forces. Otherwise, el-Mazeeni (age 70) was the only one who spent his entire career under Qaddafi’s command although he did not have a political reputation. Ubaidi was in the staff of the assassinated head of the rebellion Major General Abdel-Fattah Younis, and el-Emami was his friend. Little links these attacks on army men with the attacks on the French, first the car bomb outside their Tripoli embassy in April and in early July a storm of gunfire at the convoy of France’s consul Jean Dufriche in Benghazi. The only bind is that these are targeted attacks that seem geared toward creating an atmosphere of instability in the country. When the Libyan elect gather at the Corinthia Hotel in the well-appointed al Gadim area of Tripoli to talk about oil and gas in September, this gunfire will be on their minds. Oil deals have been swift, and revenues have begun to flow in. What spurred on the rebellion in 2011 was not Qaddafi’s prisons alone, although that is what motivated the political Islamists who knew its walls well. The bulk of the people who supported Qaddafi’s overthrow had begun to experience the down-side of neo-liberal policy – oil revenues had ceased to be transferred for their well-being and new opportunities for the next generations did not seem on the horizon (all this I detail in Arab Spring, Libyan Winter). This lesson is not clear to the new elect in Tripoli, who seem to believe that as long as they appear responsible to their Western backers and as long as they get the oil out and the revenue in all will be well. Rumbles from the ground show that the demands are greater than that, and that the demands cannot be met by the current dispensation. In Egypt, it was mass demonstrations in concert with the army that led to Mubarak’s ouster in January 2011. Much the same sort of grammar led to the removal of Morsi last month. 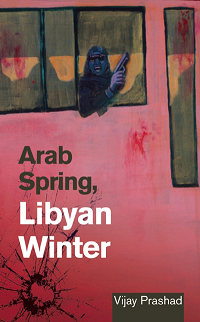 It was an armed uprising against Qaddafi, not mass demonstrations that threatened the Libyan regime. That NATO entered the fray simply hastened the end of the regime and handed over its keys to the neo-liberal technocrats (such as Mahmud Jibril and Shukri Ghanem). The new violence in Libya runs parallel to the new crowds in Tahrir Square. They are not happy with the first flush of what their rebellion produced. They are at it again. Not in five-star hotels but in their hovels.